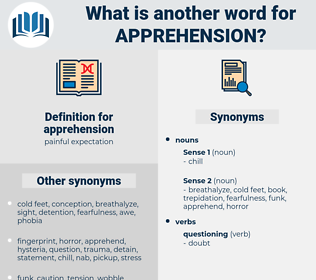 What is another word for apprehension? fear of carrying out activity. 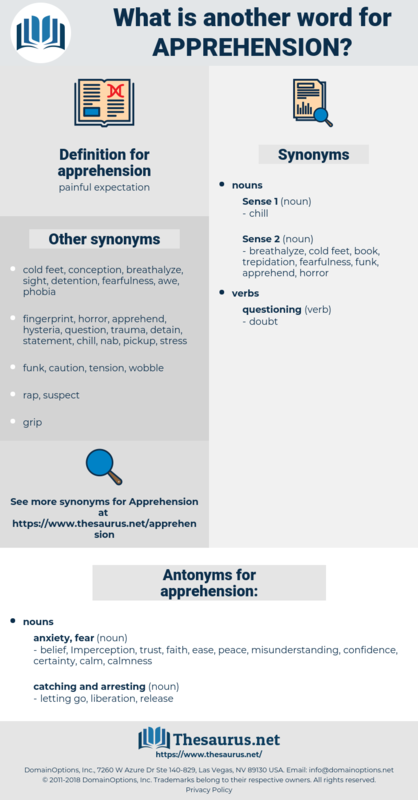 Apprehending, perception, consternation, Detainment, grasp, incarceration, impression, threat, interdiction. concern, anxiety, worry, apprehend, uneasiness, arrest, disquiet, unease, preoccupation, suspicion, hesitation, arresting, dread, understanding, alarm, awe, doubt, confiscation, confusion, scare. belief, Imperception, trust, faith, ease, peace, misunderstanding, confidence, certainty, calm, calmness. easiness, quiet, relief, solace, comfort, contentment, Misperception, content, placidness, consolation, optimism, security, emancipation, excitement, anticipation, discharge, hope, repose, unconcern, hopefulness, quietude. She went on to the apprehension of a change in him that hitherto she had not permitted herself to see - a change in his attitude to her. Amory, frantic with apprehension, had stayed behind with Jarvo, certain that St. George could not have left the mountain. gloom, gloominess, boding, pall, somberness, trepidation, foreboding, sombreness, chill, premonition, presentiment, suspense.